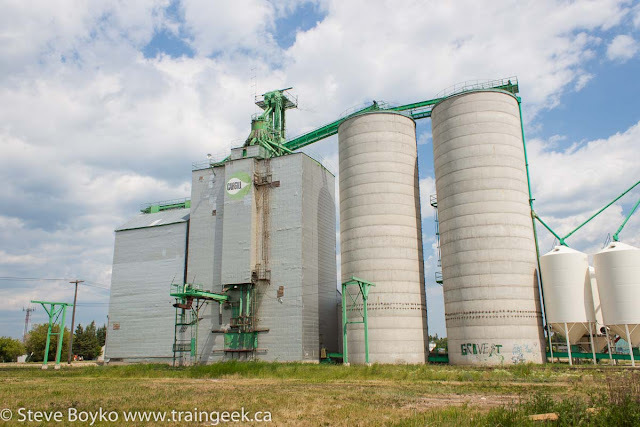 This post is part 4 of a series featuring the grain elevators of northwest Manitoba. Start at the beginning. 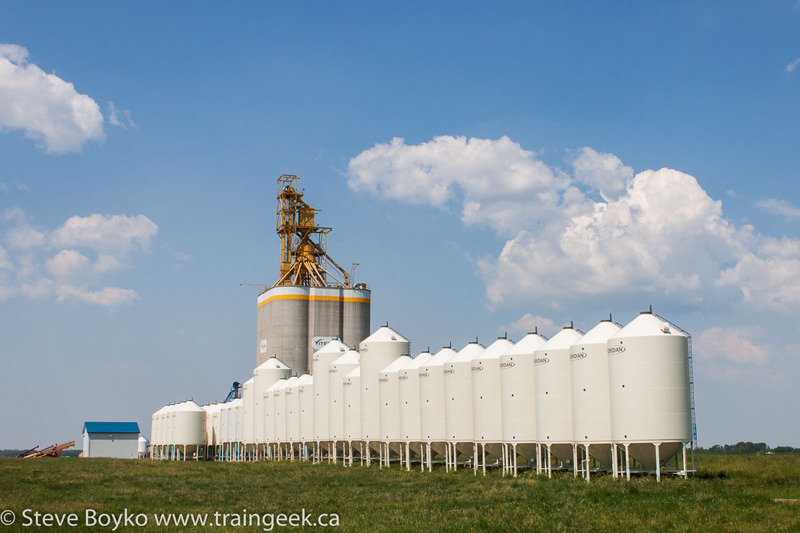 After I reluctantly left Inglis, I headed north to pick up a number of grain elevators en route to Birch River. 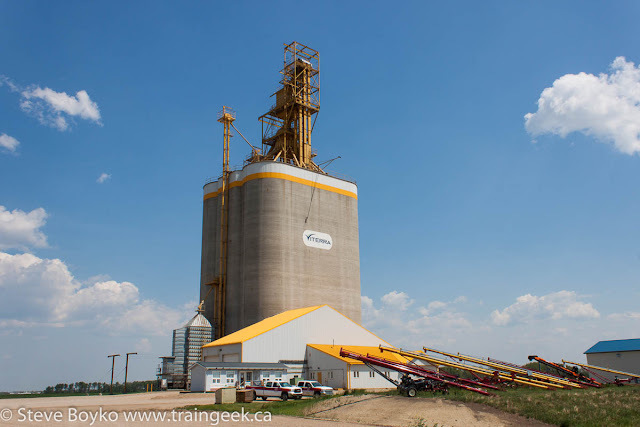 I passed through Roblin again, and fueled up at the local Co-Op before continuing to the Viterra concrete elevator just north of town. This elevator is on the tail of a wye off the CN Togo subdivision. 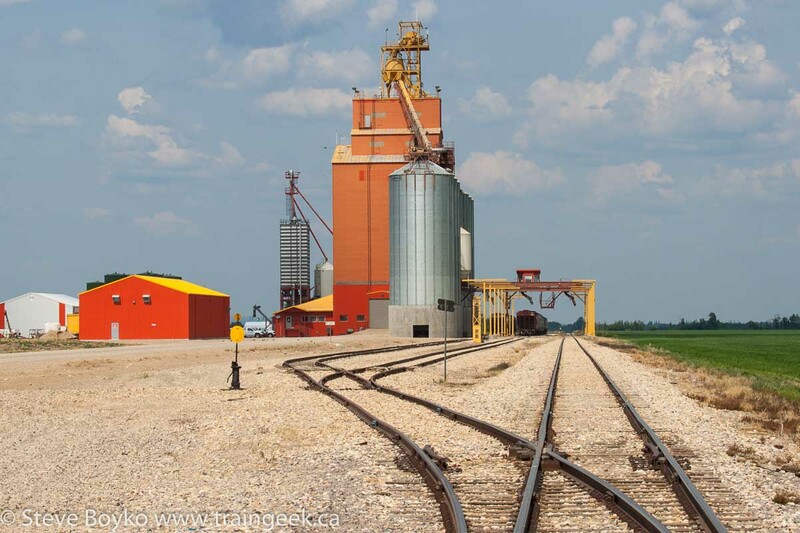 CN lists it with a capacity of 12,300 tonnes and the ability to spot 50+ cars. 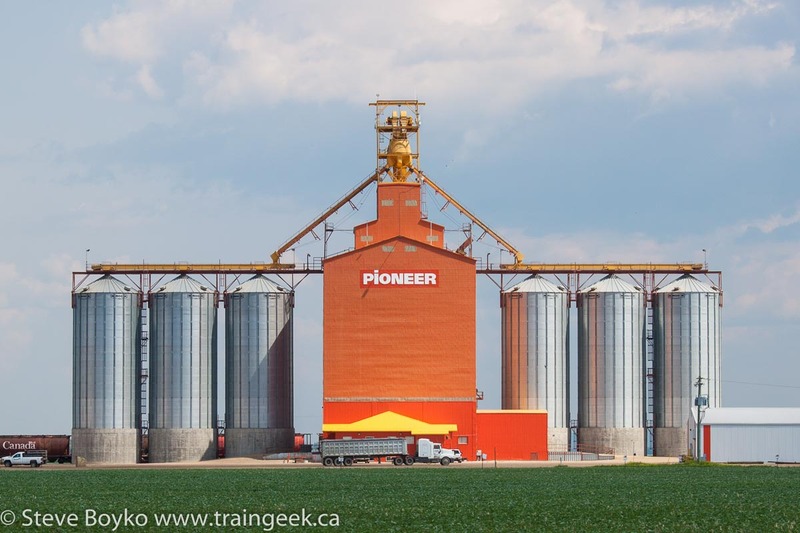 It was a long drive north on highway 83 to my next destination, Kenville, to see the Pioneer grain elevator there. 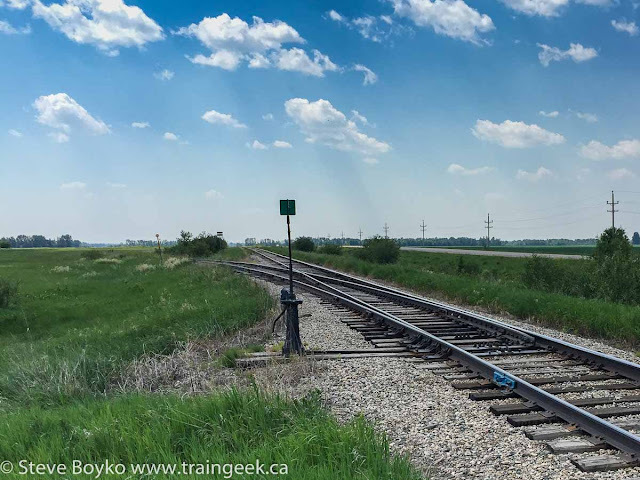 In my planning I had considered ducking into Saskatchewan during this part of the trip to grab elevators near the MB-SK border, but the trip was long enough without getting greedy. Keep your eye on the prize! I arrived at the GPS coordinates for the Kenville elevator to find... this. There should be an elevator on the left side of the photo, but no, nothing. I checked my coordinates, I checked the mileage on the crossing sign (CN Preeceville mile 7.74)... all correct. 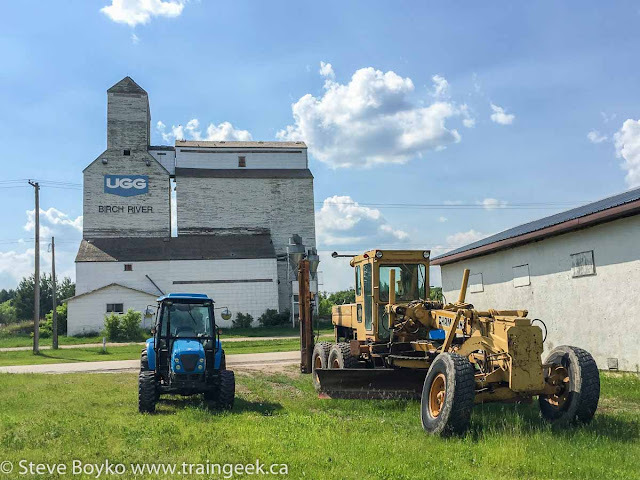 I drove in and saw the cleared area where the elevator was but it had been demolished sometime in late 2014, since Matt Tolton last photographed it in July 2014. Here's what it looked like, courtesy of Google Street View. It had a capacity of 3,280 tonnes, pretty small for online elevators these days. Kenville had a Pool elevator but that apparently came down around 1999-2000. I carried on north toward Swan River, where I knew there were two, maybe three elevators. 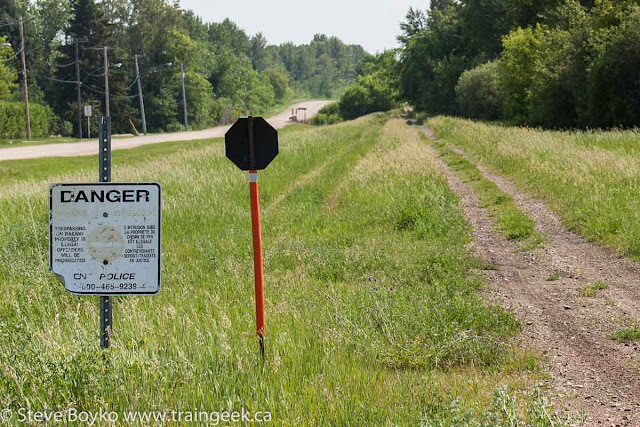 On the way I found the junction between the Preeceville subdivision and the stub of the CN Cowan subdivision, at the impressively named Thunderhill Junction. This was a telephoto shot from a crossing 0.2 miles away so there is some heat blur. Thunderhill Junction is at mile 96.8 and the former Cowan subdivision is now the Swan River spur, extending 1.7 miles north of the Junction into Swan River, and extending 13.3 miles south/east to a Louisiana Pacific OSB (Oriented Strand Board) mill. More about that later. I drove into Swan River to find one grain elevator remaining in the town itself, a Cargill elevator. 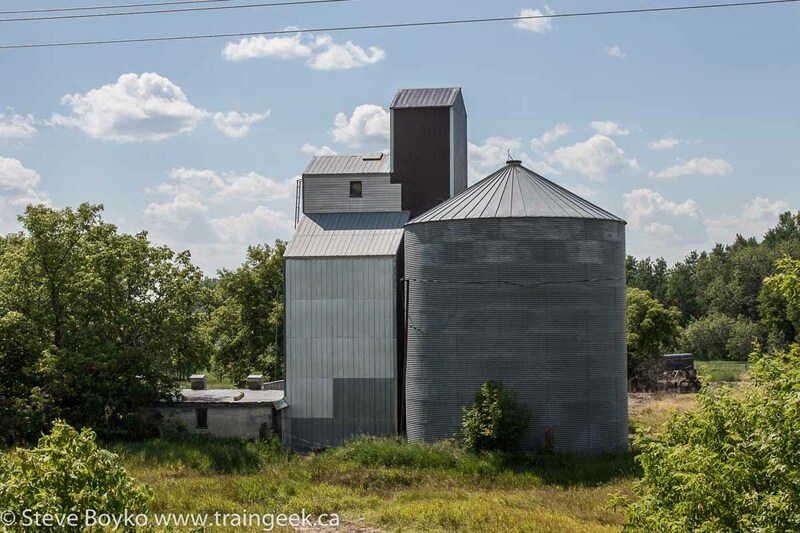 You can see the original elevator plus annex has had a couple of concrete silos added. It has a capacity of 5,600 tonnes. There is a wye behind the grain elevator. You can see one leg of the wye in the foreground of the photo above. I would say it doesn't get used any more. 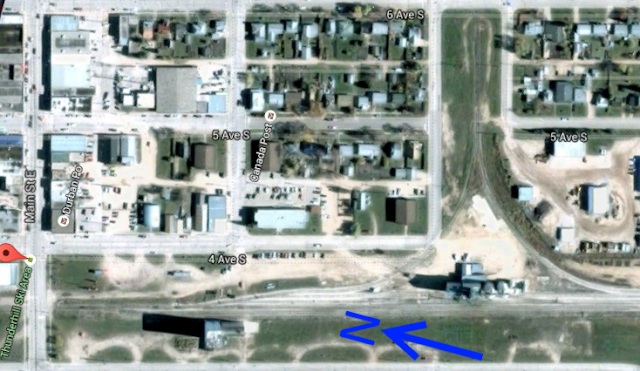 There was a second grain elevator on the other side of the tracks from this elevator, and it still shows in Google's satellite view, but it's gone. This may have been Swan River D with a capacity of 3,750 tonnes. You can see the existing Cargill elevator inside the wye, and the former elevator casting a long shadow at the bottom of the image above. This image and this image show elevator D, a concrete elevator with a crib annex. It was gone by the end of 2009. 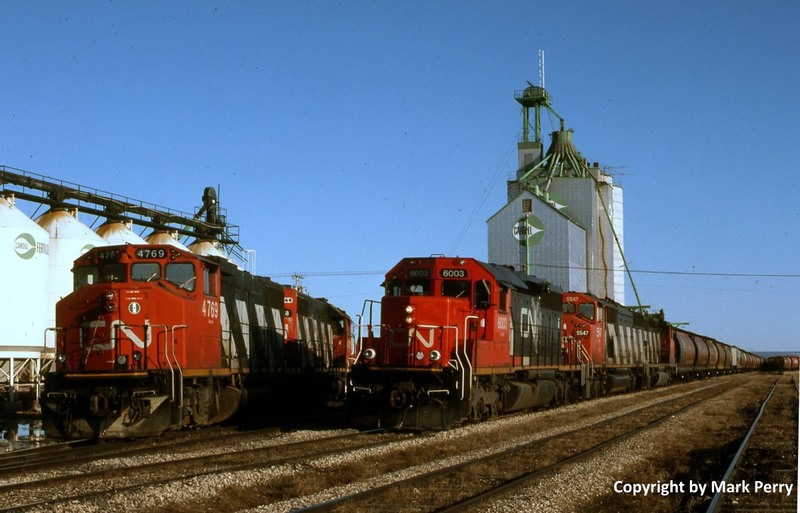 Mark Perry took this photo of two CN trains in Swan River, Manitoba back on May 1, 1996. CN train 581 (Dauphin-Birch River) had CN 4769 and CN 4728 and CN train 587 (Canora-Swan River) had CN 6003, CN 5547 and CN 5244. 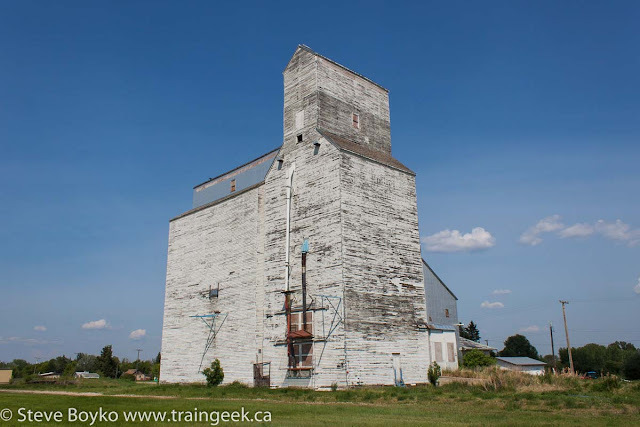 There is another grain elevator at the north end of town, Swan River A, which looks like a former Manitoba Pool elevator. 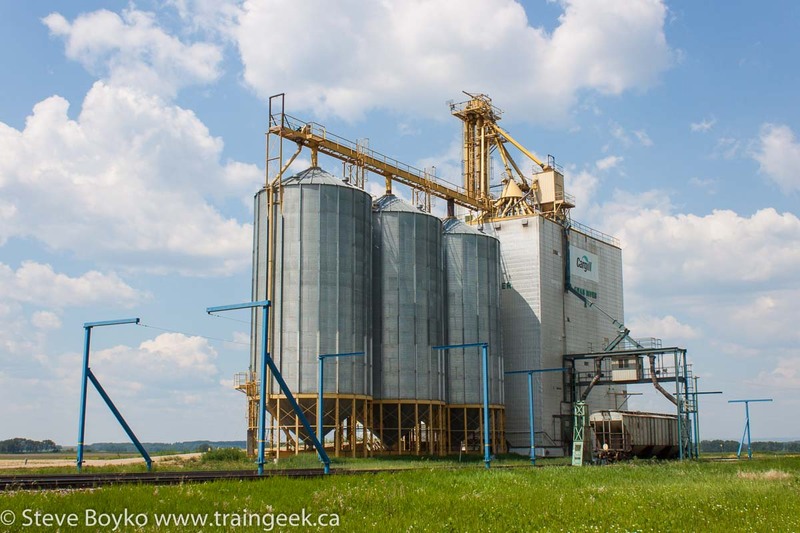 In fact it was an Agricore elevator back in 2004 and had a capacity of 5,680 tonnes. As you can see, there was a car spotted at the elevator. In fact there were about a half dozen other cars just south of the elevator. They were a variety of road names including this interesting car formerly owned by the Frank Brothers Feed and Grain Company of Wells, Minnesota. It looks like the Frank Brothers were in financial difficulty at one point. 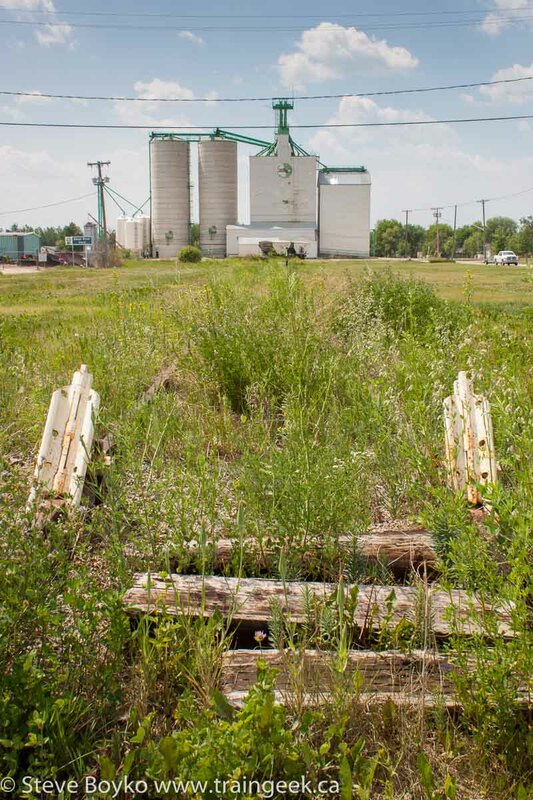 Their elevator in Wells was recently demolished. Sadly these two elevators are slated for demolition. 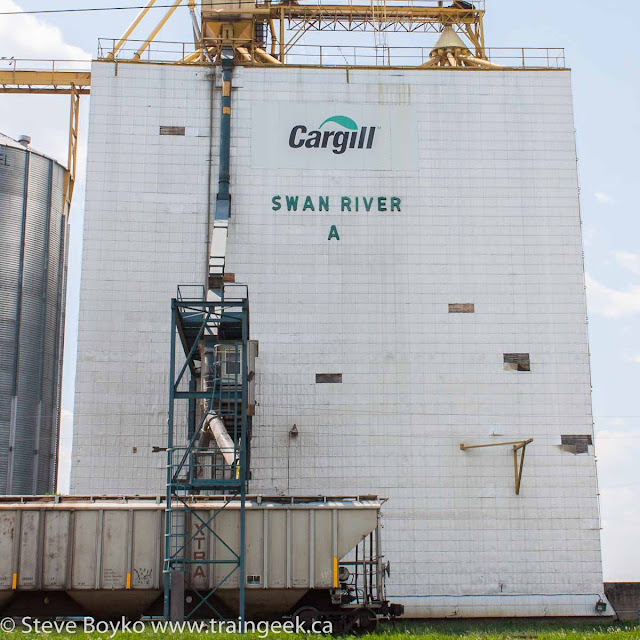 They were closed as of May 31 2015 and this Cargill notice says they will be demolished by the end of 2015. I'm glad I was able to photograph them before they go. Swan River was the junction of the Cowan and Erwood subdivisions. The CN Erwood subdivision is now a 7.1 mile spur that terminates at a Pioneer grain elevator north of Swan River. This elevator seems to be doing well so hopefully that will keep the remaining trackage in operation for years to come. Note the derail right on the "main line" at mile 5.01. Since it's the end of the line, all three tracks can be used for loading! 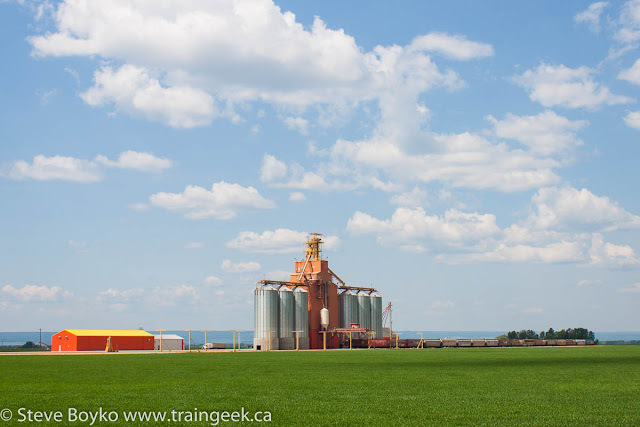 A little waiting for the sun to pop out produced this side shot of the Pioneer Swan River Valley elevator. CN lists this elevator as 13,310 tonnes capacity with the ability to spot 100+ cars. Next up was Bowsman, where I did not expect to find an elevator. I had been told it came down and I confirmed there was no elevator (or track) there. En route to Bowsman I did spy this farm elevator just off the highway. It is a bit of a Frankenstein affair, apparently. 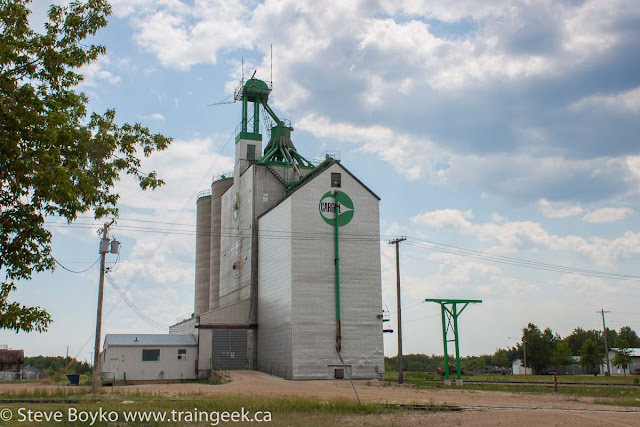 The town of Birch River has a single grain elevator, a lovely old ex-UGG elevator and annex. 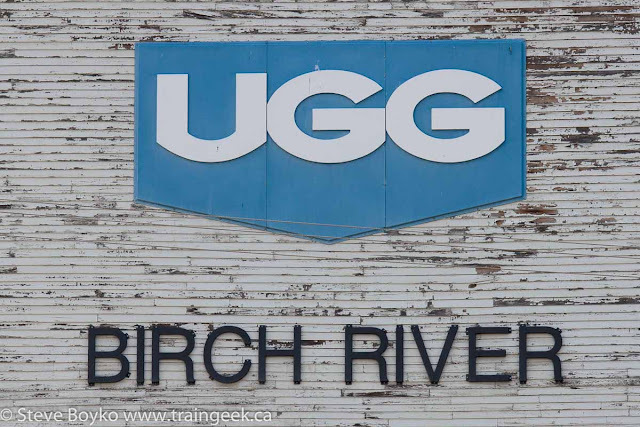 The UGG logo still shows loud and proud, if a bit faded. It doesn't look like the elevator is in use any more. I hope something can be done to preserve this lovely relic. I did a little HDR photo with my iPhone 6 to include the Champion grader and the little tractor nearby, against the sun. 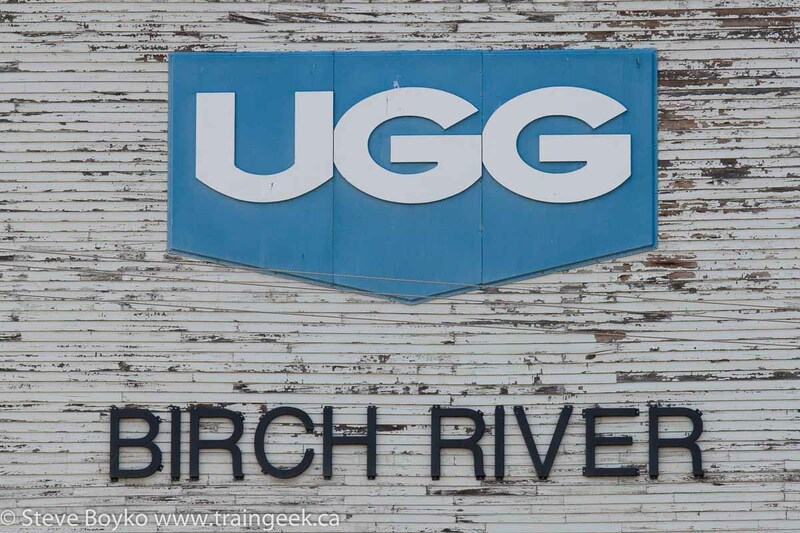 A bit of trivia - Birch River is the most northerly remaining wooden grain elevator in Manitoba. I thought it was funny that a CN Police sign still stood beside the former right-of-way even though the rails have been gone for a number of years. 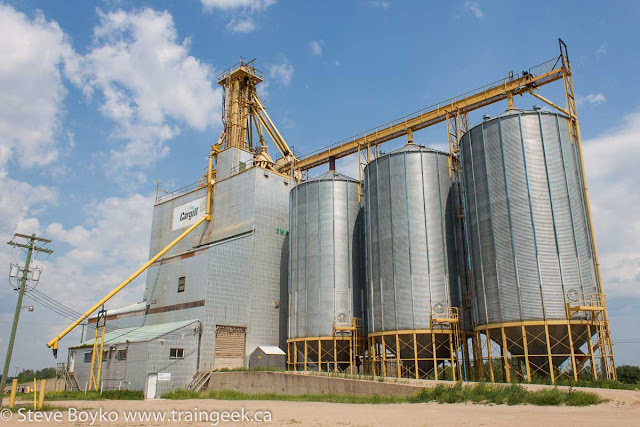 I wrote a post on the Birch River grain elevator. That was the end of that leg of the trip. I had three elevators left to photograph: Ethelbert, Winnipegosis and Fork River. Along the way I photographed a few churches and other interesting stuff... read on. Too bad about the Cargill elevator(s) coming down later this year. I could sure use some of that aluminum cladding they have for some of the miniature elevators I am cobbling together. I see there is some contact info at the end of that Cargill notice. Have to look into that. That heat blur shot of Thunderhill Jct. is captivating, couldn't take my eyes off of it. Sort of mesmerizing. 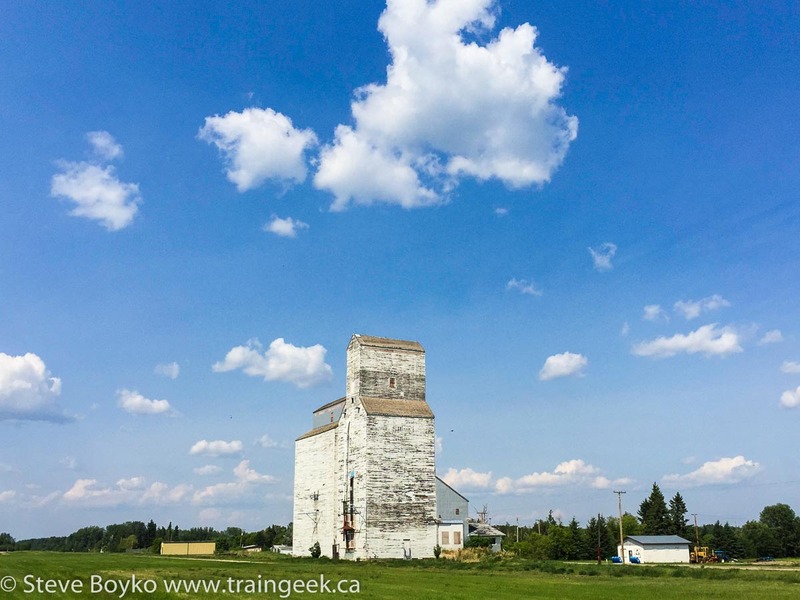 The Birch River elevator is a classic. Thanks, Glen. I see that aluminum cladding lying in the grass around elevators, a piece here and there. It's quite thin and would probably work well for your miniature elevators. it's great to see that some of those old elevators are still in use. not many in southern manitoba still are. Really sad to see all the old elevators and track no longer in the Swan Valley area. I remember spending my summers with my grandma in Swan River. 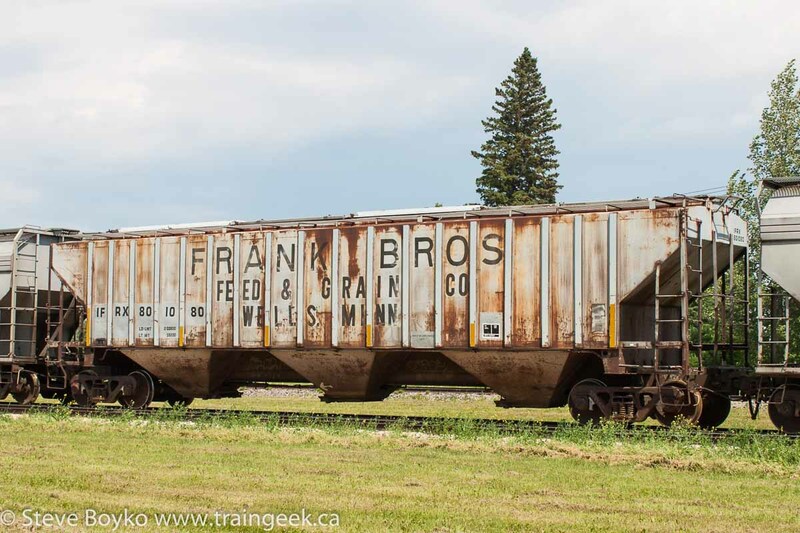 We took the train from Gillam, MB to Swan River. 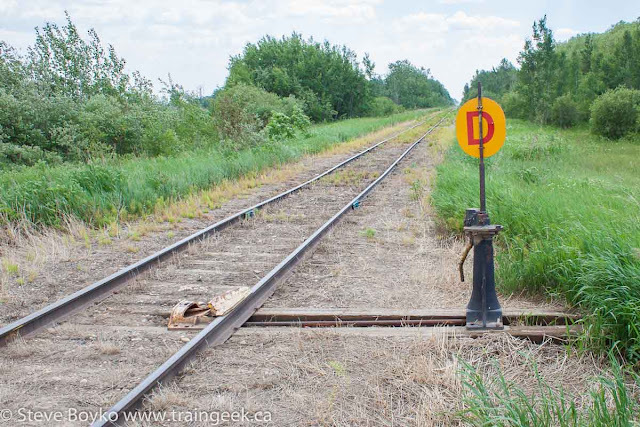 The old CN Erwood line from Hudson Bay, SK to Swan River, MB was still in operation. I came back to the valley to visit some friends and relatives in the last few years and sad to see the valley deteriorating. 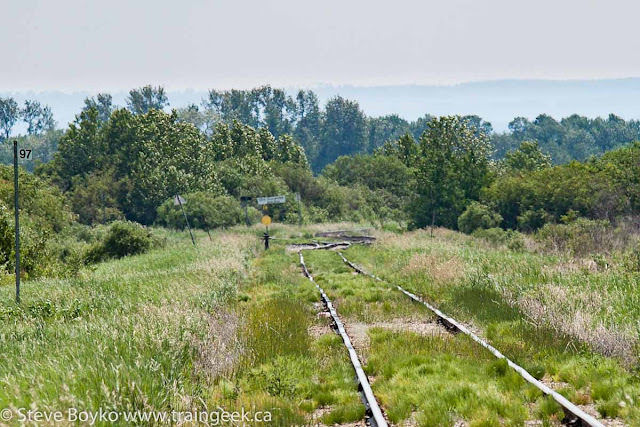 The rail line was part of the valley. Sad to see the old elevators go including the old 20 storey cement elevator that was torn down in 2007. Hi Jeff, thanks for sharing your memories of the Swan River / valley area.